In college, I had a creative writing professor who claimed Junot Díaz had read 100 short-story collections before he penned a single word of his first book of stories, Drown. That professor (or maybe it was a friend of hers) later met Díaz and asked him if that was true. It turned out to be false. He had actually read 400 books of short stories. In This Is How You Lose Her, the boy is Yunior (who appears in Drown and Oscar Wao), a Dominican American stud who suffers every sort of love because he can’t escape the macho culture he identifies with. There’s young love, familial love, forbidden love. And, of course, there’s heartbreak, embodied in the book’s final and best story, “The Cheater’s Guide to Love,” a devastating narrative of Yunior paying the ultimate price for his unfaithfulness. (It appeared in a July issue of The New Yorker.) All of the elements that made Oscar Wao a favorite among the literati and casual readers are here: playful dialogue, vibrant prose, an extraordinary sense of humor, and a surprisingly frequent tug on the heart strings. September is the biggest month for fiction. Literary heavyweights Michael Chabon and Zadie Smith have new novels this month, both of which are over 400 pages and a disappointment considering their talents. But whereas Chabon and Smith have gone for big page counts to confront sweeping ideas, Díaz prefers working in the opposite direction. While reading This Is How You Lose Her, I couldn’t help but think to myself that this is the way contemporary literature should feel and sound. Oscar Wao was an epic that exploded Dominican history, family tradition, and pop culture, yet managed to confine it to the story of a hopeless nerd. Only Díaz, the sort of author that would read several thousand short stories before penning one, could bring the same big-picture exploration of love in nine brief tales. 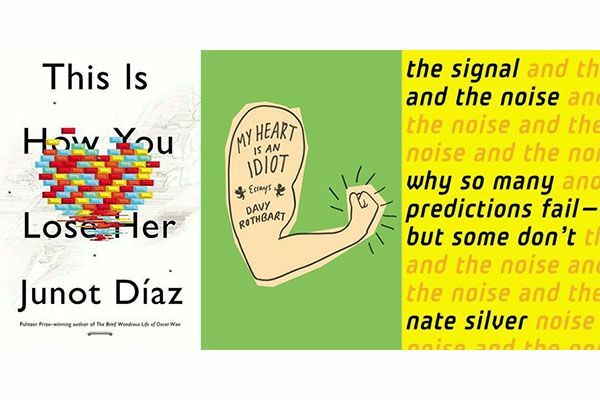 My Heart Is an Idiot is an essay collection based on the idea that author (and Grantland contributor) Davy Rothbart is terrible with women (maybe that’s this month’s literary theme). “Some folks fall in love gradually,” he writes. “For me it always happens in an instant.” But Rothbart’s love’s labors lost are just an entryway into much bigger stories. I didn’t realize until a later essay that Rothbart is also a contributor to This American Life, which perhaps explains the author’s gift for unconventional storytelling. My Heart Is an Idiot is a collection of far-fetched stories, but Rothbart grounds his antics with humor, contemplation, and empathy. The first few chapters feel like a lot of throat clearing. Sometimes it reads like a clever intro class lecture (“Risk greases the wheels of a free-market economy; uncertainty grinds them to a halt”), even if it does include one of the swiftest accounts of the financial crisis that I’ve read. But Silver is interested in giving the readers the fundamentals of predictions. Power through the first hundred pages and you’ll be rewarded with the fun stuff: predicting baseball, earthquakes, and poker hands; I particularly like the chapter in which Silver explores the design of Deep Blue, that chess-playing computer that defeated Soviet champ Garry Kasparov. How good we think we are at prediction and how good we really are may be inversely correlated. The 1950s, when the world was still shaken by the war and was seen as fairly unpredictable, was a time of more economic and scientific productivity than the 1970s, the decade when we thought we could predict everything, but couldn’t. The most reliable forecasters aren’t right all the time; they know what they don’t know. TL;DR: When I predict 9 out of 10 people will enjoy this book, I’m also predicting that 1 out of 10 will not.